I haven’t actually birthed using the Hypnobabies course yet, but I have SO much more faith in it than in hypnobirthing. The week-by-week (and in the maintenance phase, day-by-day) schedule is VERY easy to follow. There are more hypnosis tracks (19) to listen to covering more topics. DH is still not very interested (not negative, just not willing to prepare in any way), but I feel like it doesn’t matter nearly as much as I have so much more information available to me–plus I’ve hired a doula who is really interested in hypnosis, so she’ll be there to help me out when needed. Susan: I didn’t understand the differences in my first pregnancy and took a HypnoBirthing class. There weren’t any local Hypnobabies classes at the time, so my thinking was that a live class would be better for a FTM than a home study class. Unfortunately, I quickly learned that assumption was wrong. 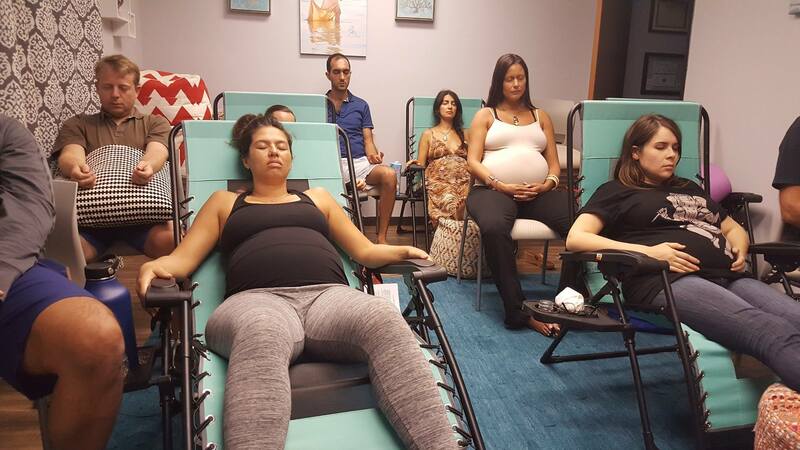 The HypnoBirthing class taught us almost nothing about birth and provided very little information on what to do during the birth. My husband and I left the last class with a belief that birth could be comfortable, but no idea how to achieve that. It didn’t go well. So when we were expecting our second baby, we used the Hypnobabies Home Study and were SO much happier with it. I literally learned more in the first half-hour after opening the Hypnobabies package than I had in all 5 weeks of our HypnoBirthing class. The depth of knowledge and power of the hypnosis skills blew the little we learned in the earlier class out of the water. Hypnobabies helped us have a much more enjoyable, comfortable an safer birth. Kirsten D: I had 3 babies before Hypnobabies. Hospital babies. Medically orchestrated babies. Nightmare deliveries. Prep was the hospital course, where they tell you Pitocin does not make birth waves stronger…lies…. They told me how to behave to make life easy for hospital staff. Hypnobabies was a ray of light. I had 3 more babies. Hypnobabies. A home birth, a vaginal breech birth. With Hypnobabies. I wish I had had Hypnobabies from the start, but thanks to having a variety of experiences, I can wholeheartedly endorse Hypnobabies. God bless you, Kerry! Carly A: I did Hypnobirthing on my first, and Hypnobabies on my second. I felt FAR more prepared and much more calm and comfortable on my second. Second baby, used Hypnobabies, was in birthing time all day but was so comfortable we didn’t make it to the birthing center before his head was born in the car, got to parking lot and midwives helped deliver the rest of my 9 lb 15 oz baby boy 🙂 Hypnobabies is so amazing! Oh, and number 2 is nursing like a champ! July P: For my first baby I used a class called natural childbirth offered at the hospital. I was extremely tense during that labor and my baby did not descend. I had a C-section with her. My hypnobaby on the other hand came in three hours. love Hypnobabies and I would recommend it to anyone. I loved using the hypnosis tools before labor and during it. Labor was so much more manageable using the program. Vanessa M: I used Lamaze and HypnoBirthing … nope, didn’t work. So excited to use Hypnobabies this time since I’ve read it works so much better! Bridget E: With my first I just took the hospital class. I wasn’t sure if I wanted to go natural at the time, because I was so scared of pain and the unknown, so I decided to play it by ear. I’d heard great things of Lamaze from my mom and other ladies but every time I looked into the “breathing techniques” I just couldn’t buy it. I would probably end up working myself into tizzy trying to figure how to do the breathing right and end up with more stressed. I didn’t really have a plan other than to see how far I could make it without meds and I didn’t last long. Cervadil–Pitocin induction at 41 weeks, begged for epidural at 2cm! Second baby, I found Hypnobabies and dived in head first. Felt so confident and excited for the birth, despite how much I disliked my first one. Water broke naturally on my due date at 6pm and by midnight I had delivered a 10lb 15oz completely natural! Labor was an absolute breeze due to the hypnosis techniques I had taught myself, and my Hypnobabies birth tracks playing on my iPod. Nothing compares to the confidence this program gives you. Love it! Shary J. then asked: How different is the Bradley method compared to Hypnobabies? I’m torn between the two, don’t know which one to take! Portia C: For my first child I used the Bradley method and had a hard hospital birth with unwanted medical intervention 30 hours after my water broke. For my second child I had in September, I used Hypnobabies and had an AWESOME birthing experience. Labor started at 8 PM, I went to bed at midnight listening to my birthing day affirmations/ first stage labor, went to the birthing center at 7AM well rested and had my baby girl at 8AM! Such a better way to relax, be more comfortable and let your body do the work! Susan M: I took Bradley for my first and used Hypnobabies home study with my second, with much better results – I felt comfortable for most of my Hypnobabies birth! I’m now a Hypnobabies instructor. I love the whole Hypnobabies philosophy and see more and more how it applies not only to birth but life in general. Our minds, thoughts, and the words we choose to use are so powerful. I saw it in my birth experiences too. And I have to agree that you get everything and more in Hypnobabies that you would get in other classes.